U.S. Conn Library renovations were recently completed. 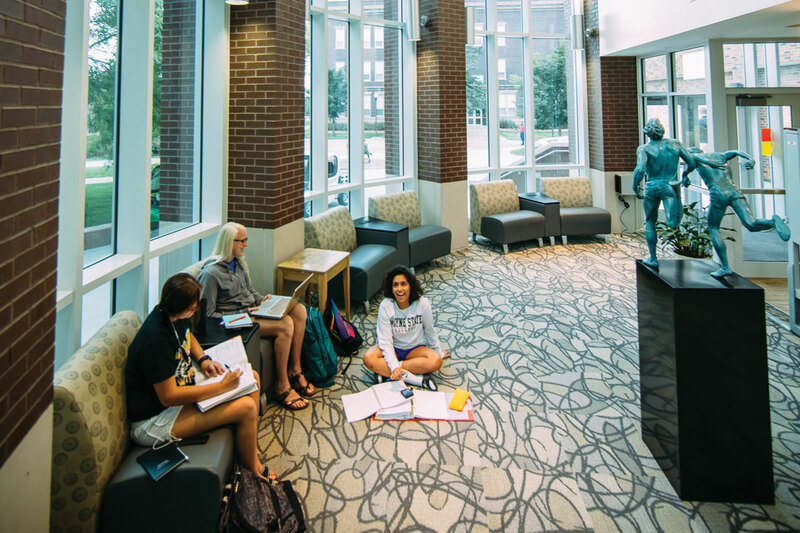 Our Wildcats have varied interests, but they also have one thing in common: They feel at home at WSC, and they know there is no better place to learn than right here. They come from the rural Midwest, the coasts, urban areas, and overseas. They bring a wide range of passions and interests with them, all looking for different things. But when these dynamic students venture to the campus of Wayne State College in small-town Nebraska, they notice something that distinguishes it. Cited time after time, it is what makes this place extra special – the supportive people they meet, the Wildcat family. “It just feels like home,” the students often say – even if it’s their first visit here. Wayne State takes pride in building these young people who already have so much to offer. These students know the value of a quality education and are quick to acknowledge the generous support available to them here. They are genuinely interested in serving as contributing members of society through medicine, teaching, art, business, and many other career fields. And they know there is no better place to learn how to do this than at Wayne State College. But don’t take our word for it. Read for yourself about our exceptional, passionate students, all part of the Wildcat family. Career goals after graduation: To be quite honest, my ultimate dream is to have a summer Bible camp. That, of course, is something that I will definitely have to work hard for. It is indeed possible, however! Not saying that my dream is not possible, but in real terms, I would love to work for Wayne State College as an admissions representative to recruit students like myself. I am bilingual, so I can use my talents to reach out to Hispanics to come to a college that changed my life and made life amazing for me. I enjoy talking to different people and listening to their stories. What better way to do that than to work in that profession? Why did you choose to attend WSC? I initially wanted to go to the University of South Dakota. I enrolled in the university, but something did not seem right. Something inside me was saying that Wayne State is the right school. In my culture, we are known to have family close. We are not known to leave each other. My mom and dad were saddened because their girl was leaving the nest. I came to the conclusion of, why spend more on schooling when I have a perfect, affordable, and close-to-home school? I am the second of four but the first one to actually attend college. Ultimately, Wayne State was right for me because I was in a town that I loved and a community that supported me since day one. What support have you experienced at WSC that has made your time here a success? I can go on and on about the help I have received here. Besides God’s grace to me and an abundance of support, scholarships and grants are getting me through school. I am lucky to be debt-free. I could probably write a book on all my influences/mentors I have had, but to sum it up, I have had quite a bit of support from not only family members, but also community and faculty members. I have been truly blessed. Career goals after graduation: I would love to work in a high school and teach an upper level biology course. I would love to potentially co-teach classes with special education teachers. Why did you choose to attend WSC? I chose WSC because it felt like home. The softball team, faculty, staff, and students were all very welcoming. I loved the small-town atmosphere. What support have you experienced at WSC that has made your time here a success? I have received so much support from all the faculty and staff. Our softball coaches, Shelli Manson and Krissi Oliver, are very supportive. They do a great job emphasizing how important academics are and making sure we are successful within the classroom. I have also utilized the counseling department on campus. They really helped me with my transition into college, and it’s nice to be able to talk to an outside person. I’m very thankful WSC provides counseling services for us. The education department has been phenomenal. Dr. Laura Franklin has helped me immensely within the education department. She has guided and helped me find my passion within education. I have also received various scholarships through the school. I am currently on an athletic scholarship, and I have also received an LGBTQ scholarship. I am so thankful and grateful for all of these opportunities that have helped me throughout my education career! Career goals after graduation: I am currently applying to graduate school back in France (Grenoble Ecole de Management) for the Master of International Business Program. My long-term goal is to find a managerial position that has strong international ties. Why did you choose to attend WSC? The track and field program and the fact that Wayne State does offer international business were the two main factors that pushed me to pick WSC. I also really enjoyed my visit in 2016, and Wayne has everything a middle-distance runner like me can use to be successful (indoor track, outdoor track, great coaching staff, great training room, endless gravel and dirt roads). What support have you experienced at WSC that has made your time here a success? Coach Brink, my teammates, faculty members… I feel like everyone I meet in Wayne is always willing to help me if I need anything. From a financial point-of-view, the international student scholarships, as well as the athletic scholarships, are tremendously helpful. Bardou is the first in his family to attend college in the United States. He transferred to Wayne as a junior from Indian Hills Community College in Ottumwa, Iowa. Hometown: Moline, Ill. My wife and I moved here four years ago because I accepted a job with the WSC baseball team. Why did you choose to attend WSC? I attended college at Iowa Western Community College, then Creighton University. I signed to play professional baseball after my junior year at Creighton. I played professionally for seven years. I got a call from Coach Koch when I was still playing, and he offered me to become the assistant coach here. I felt like it was too good of an opportunity to pass up. Finally, after my third year coaching, my wife and I decided it was time for me to go back and get my degree. What support have you experienced at WSC that has made your time here a success? The professors here at Wayne State College have helped me out tremendously after my nine-year absence from college. The students in the communication department have made me feel like I’m a part of the family and have made the transition a lot easier for me. Clark is also a first-generation student. Career goals after graduation: I will enter the job market and pursue a career related to my finance or marketing degree. I have not settled on a specific career path as my major and emphasis allow me to move in multiple directions. I am also considering pursuing a post-graduate degree. Why did you choose to attend WSC? The primary reason I chose to attend WSC was for its affordability and reputation for quality education. I also liked the smaller class sizes and easy access to everything on campus. My final decision was made when I was granted the Nebraska State College System (NSCS)Board of Trustees Scholarship. material, and even something as simple as asking how my day is or how my rugby game went. I truly appreciate the time my professors put into getting to know me personally. Why did you choose to attend WSC? I chose Wayne because of their great education program, and the cost was so affordable. What support have you experienced at WSC that has made your time here a success? The professors here have been so supportive and have helped me grow so much in becoming a future teacher. Also the admissions office workers have been some of the best people to work with! Mayo will also be the first person in his family to graduate from a four-year school. Why did you choose to attend WSC? I chose to attend WSC because of the small-town family atmosphere that I experienced my first time on campus as a junior in high school. I immediately fell in love with the beautiful campus and everything it had to offer. When I came here to interview for the RHOP program, I immediately noticed the true care and concern the instructors had for their students. It was clear to me that the instructors weren’t afraid to tell students when they needed to study harder or to congratulate them when they succeeded. I loved this about my small high school, so when it came time to select a college, WSC was a no-brainer. What support have you experienced at WSC that has made your time here a success? The RHOP program has pushed me to become the best student I could be, helping me to prepare for medical school. Instructors such as Drs. Doug Christensen, Shawn Pearcy, and Gustavo Zardeneta have all challenged me along the way to become the best student (and person) I could become. They, too, told me when I needed to study harder and were some of the first to congratulate me when I did well on a test. The generous support from our alumni and Foundation donors has also helped me graduate college debt-free, something I’ll be forever grateful for. Carlson’s grandfather, Rich McGill ’70, MSE ’72, is a Wayne State College alumnus. Career goals after graduation: With my degree, I would like to either teach music and direct a band or choir at the high school level or go on to pursue a master’s and doctorate in music to teach at the college level – I have not decided on that yet. Why did you choose to attend WSC? While I was in high school, I became familiar with several members of the Music Department faculty through honor bands, band camps, and visits, and they made me excited for college. I came up to campus to visit Ben and for several campus visits and immediately felt at home. What support have you experienced at WSC that has made your time here a success? I received the John G. Neihardt Scholarship and have been constantly encouraged by my advisor and professors. Having my brother Ben here is also encouraging. We support each other and help each other at every opportunity. Katie and Ben Aschoff, brother and sister from small-town Nebraska, value family ties. Now the Aschoff siblings are both part of the Wildcat family too! Extracurricular activities at WSC: Instrumental groups (trumpet) – Wind Ensemble, Jazz Ensemble, Brass Ensemble, Pep Band; drum major of the Wildcat Marching Band, Vice President of Kappa Kappa Psi. Why did you choose to attend WSC? I chose WSC because of its smaller size, it’s pretty close to home, I wanted a four-year college experience, and I was interested in the industrial technology department. What support have you experienced at WSC that has made your time here a success? My advisor has helped set me on the right path academically. Double majoring wasn’t anything I thought I could ever do, and with his help, I’m excited to accomplish that goal. I have also developed a very special relationship with the faculty from the Department of Music. Dr. Bohnert and Dr. Calkin push me to do better every day, and I’ve been provided with a lot of cool opportunities that I’m very grateful for. Career goals after graduation: I plan to apply for medical school this next year and remain open-minded as far as specialties go, but I certainly have a love for surgery! Why did you choose to attend WSC? I initially went to school at Southeast Community College in Lincoln as a single mother and became a certified surgical technologist. After working in surgery for nearly five years, I knew I was dedicated to a career in health care but also recognized my desire to further my education. Fortunately, living in Norfolk, Wayne State College is an easy commute and well-known to medical schools for producing well-prepared undergraduates. As a non-traditional student, I was leery about going back to school but believed WSC would be a good fit for me with smaller classes and more of a one-on-one learning opportunity. What support have you experienced at WSC that has made your time here a success? With the help of my professors who clearly have a love for what they teach, I went from doubting myself to feeling confident in my ability to succeed. I am forever grateful to the life sciences professors at WSC for their investment in my education. I never imagined just how intrigued I would be by the material covered in all of my classes, and I truly look forward to the rest of my time at Wayne. Why did you choose to attend WSC? I didn’t know where I wanted to go coming out of high school, so my parents helped me and hired a college coach. She asked me what I wanted out of a school. I said I wanted a small, affordable college, out of state, a high percentage of four-year graduates, and one that would work with my GPA, SAT, and ACT scores. Five schools popped up, and Wayne was the second one for me to visit. I loved their program, the culture was completely different, and the tour was amazing. I said I would try it out for a year, and if I don’t like it, I can always transfer. But here I am graduating! What support have you experienced at WSC that has made your time here a success? I’ve had support from every single person here, from my department chair to the lunch ladies in the cafeteria. I couldn’t have made it through college without the help of everyone here. I know I could have three jobs right now with the admissions staff talking me up. I know I wouldn’t have had an internship without Career Services. I know I wouldn’t have a job ready for me without my professors, once I graduate. And I know I wouldn’t have been so happy and grateful to be graduating from this college if I hadn’t gone here. Thank you, Wayne State College, for such a great four years of my life! Career goals after graduation: I will be accepting a full-time position at Central Kitchen and Bath in Sioux City, Iowa. Why did you choose to attend WSC? I chose Wayne State College because of the small-town vibes and how easy it is to connect with others on campus and within the community. What support have you experienced at WSC that has made your time here a success? Support of faculty and advisors. It feels like home. The small town makes you feel more than welcomed; you get to know your professors, other students, and community members. Wayne State College is a home, and I will be sad to say goodbye. Hesse transferred to WSC after her sophomore year from Iowa Western Community College-Council Bluffs, Iowa. Career goals after graduation: I currently work for Network and Technology Services (NATS), and I really enjoy working on the student PCs, so that's one route I could take. I have also been told I would make an excellent computer science teacher so I've started to consider that. Why did you choose to attend WSC? Wayne was one of the two colleges in Nebraska that had the program of study I wanted in a four-year degree, and the professors I met here were a lot more friendly and caring than at the other college. I was also accepted into the Wildcat Academy of Leadership and Knowledge (WALK) program. What support have you experienced at WSC that has made your time here a success? The WALK program started me out at Wayne. It made me get involved and grow leadership. Career goals after graduation: I will use my degree to make an impact in the lives of my students. Why did you choose to attend WSC? I chose WSC because of the affordability, and it is an excellent school for future educators. What support have you experienced at WSC that has made your time here a success? I receive support from the community of educators that I go to class with every day. Whether it be instructors or other students in the education program, I feel this sense of community and togetherness. This feeling brings out the best in students and instructors. The Susan T. Buffet scholarship has been another form of support that has helped me during my time at Wayne State College. This scholarship has alleviated some of the financial burden of college and has allowed me to really focus on my education. Maibaum’s mother, Laurie, is a 1992 alumnus. Career goals after graduation: I would like to be accepted into dentistry school and hopefully become an orthodontist. Extracurricular activities at WSC: I am currently not involved in any extracurricular activities because I just started school at Wayne State College this year. I hope to be involved in more activities in the semesters to come. Why did you choose to attend WSC? Wayne State College is close to home and was the best option for me, being a transfer student. What support have you experienced at WSC that has made your time here a success? I received the Phi Theta Kappa transfer scholarship from Wayne State College, which has helped tremendously in funding my education. I also have become very close with some of the science teachers here, who have given me guidance and encouragement while getting ready for dentistry school. Bruening transferred to WSC from Northeast Community College. Her mother, Kristie (Snodgrass) Bruening, is a 1995 alumnus. Career goals after graduation: I want to travel the world as a photographer or become a traveling graphic designer. Either way, my goal is to travel and experience new cultures. Why did you choose to attend WSC? I chose to attend WSC because the campus is beautiful, and it was relatively close to home, while far enough away that I could be an individual. What support have you experienced at WSC that has made your time here a success? While here at Wayne State College, I've experienced a community that has welcomed me and motivated me to succeed. My professors have been very engaging and have made me feel that I am more than just a number. Career goals after graduation: I would like to graduate from Wayne State and become a teacher wherever I am needed and then someday come back to my hometown. Why did you choose to attend WSC? I chose to attend WSC because it felt like home, and I loved it from the start. I knew it was a great place for me to learn to become a teacher from such wonderful teachers themselves. What support have you experienced at WSC that has made your time here a success? In just the first semester, I have been able to build relationships with not only my teammates and friends but also the faculty. I have learned so much from them already, and they are always available to talk or assist you in any way. Moser’s parents are both alumni – Marty ’95 and Neely ’98 Moser.